Dressage is an equestrian discipline in what is commonly known today as the "English" style of riding (though there is nothing particularly English about it . . .). Thought to have descended from ancient Greek riding practices (see History below), the discipline was revitalized in Europe during the 16th and 17th centuries. The word "dressage" comes from the French dresser, meaning to train or to prepare. Ostensibly, dressage was originally intended as a way to prepare horses for close-combat warfare, though it was quickly taken up as an art form in European courts on a par with dancing and fencing. Classical schools of dressage, such as the Spanish Riding School in Vienna, were established to perfect and preserve these training methods. In the 20th century, dressage has also found a place in the world of equestrian competition, and is one of three Olympic equestrian events (the other two being stadium jumping and 3-day eventing, which itself also has a dressage component). To reach the highest levels of dressage, known in the classical school as haute école (high school), and in the competition arena as FEI or grand prix, takes many years of training and very gifted horses. However, dressage is often viewed as a useful training method for many horses that are not destined for the highest levels because of its emphasis on balance and responsiveness. The training aims at strengthening and improving a horse's natural movements - all of the movements of dressage are things horses do naturally on their own. In dressage, the rider subtly communicates with the horse through his or her aids, namely the driving aids of leg, seat, whip, and spur, and the restraining aids of seat, weight, and hand. From the very onset of training, the horse learns to go "on the bit," which is to say, accept a constant, yielding contact with the rider's hand so that the rider is able to shorten the horse's frame and communicate through the reins with very subtle movements of the hand. By asking the horse to move forward with the driving aids, but then checking that energy with the restraining aids, the horse gradually becomes more collected. The horse's bodily frame becomes more compact as the hind end comes more underneath the horse, the back rounds up, and the neck becomes arched. This makes the horse able to respond more easily and readily to the rider's cues, as it is springier on its feet and more balanced. In the early stages of training, the dressage horse is ridden straight forward and on large circles, figure-eights, and serpentines with free and lively gaits. The horse learns to respond obediently to the rider's driving and restraining aids without anxiety, and to make smooth transitions from one gait to the next (i.e. walk-trot, trot-canter, etc.). The main objectives, which are consistent throughout the horse's training, are that it move forward with energy and impulsion in a relaxed, steady cadence, with the hind feet following in the footsteps of the front feet (i.e. straight). In exercises that require the horse to bend laterally (such as a circle), it is important that the horse have a consistent bend in its vertebrae from the top of its head to the base of its tail. As the horse becomes more advanced, its frame becomes more collected. The horse learns to move laterally away from the rider's leg, so that its own legs cross underneath of itself. These lateral movements are known as leg-yielding (moving diagonally, flexed away from the direction of travel), shoulders-in, travers (haunches-in), renvers (haunches-out), and half-passing (moving diagonally, flexed in the direction of travel). Lateral work is intended to test the horse's submission to the leg, as well as to increase the reach, thrust, and carrying power of the horse's hind end. At the canter, the horse is asked to balance at the counter-canter, i.e. 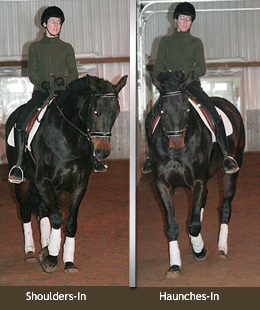 on its "wrong" lead (in the canter, only one leg leads at a time, usually the one on the inside of a circle), and also to change its lead in mid-stride, which is known as a "flying-lead-change." Within each of the horse's three gaits, different degrees of collection and extension are established. When the horse's gait is shortened and becomes more elevated, this is known as "collected." 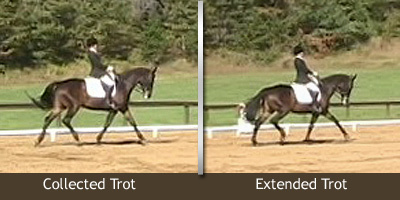 When the gait is lengthened, the horse develops a "medium" stride, and when it is asked for the maximum reach and thrust, this is known as an "extended" stride. Throughout these different degrees of collection, the same tempo is expected of the horse, so that an extended trot is no faster than a collected trot, it simply covers more ground. At the most advanced stages of training, the horse learns to collect its trot to such an extent that it literally trots in place at a slower rhythm, springing from one diagonal pair of legs to the other with lowered hindquarters, and this is called piaffe. Similar to piaffe is the passage, in which the horse is allowed to move forward in this slower, highly collected and elevated trot. At the walk and canter the horse learns to execute pirouettes, in which the hindquarters move on the spot while the forehand circles around. Flying-lead-changes are taken to a new level in what are known as "tempi changes." Moving obediently off of the rider's cues, the horse is asked to change its lead several times in succession with a precise number of strides in between. The most advanced horses learn to change their lead every stride so that they appear to be skipping. As the horse advances, it is also asked to do more difficult transitions between different gaits, stride lengths, and movements, with the goal being to keep the horse calm, relaxed, and cadenced through the transitions. In the classical school of dressage, the advanced dressage horse is sometimes taken a step farther and taught to perform airs above the ground, made famous by the Lipizzaners of the Spanish Riding School. Originally designed as battle maneuvers, the airs above the ground take to the extreme the principles of collection and a shifting of balance to the hindquarters. The most basic air is the levade, in which the horse is asked to lower its hindquarters and collect to such an extent that the forelegs come off the ground. From this position some horses learn to spring up into the air. 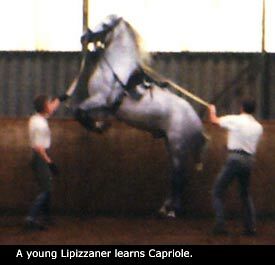 When this is done several times in a row, it is known as courbette, and when the horse jumps into the air and simultaneously kicks out with its hind legs, this is known as capriole. These moves are not part of competitive dressage, and indeed, the large warmbloods that are now fashionable for the sport are ill suited to perform them. More compact horses with exceptional strength in the back and hindquarters, such as the Lipizzaners, are more appropriate for such movements. Even among Lipizzaners, only a few ever demonstrate the ability to perform airs above the ground with brilliance and finesse, and most of these only learn one of the airs. Unfortunately, because so little is generally known about the art of dressage, many people have mistaken ideas about it. Dressage is not the same as circus riding, though to the outside eye, some of the movements may appear similar. Circus horses are trained according to the principles of stimulus/response, with the goal of producing responses that appear to be tricks. There is generally little attention given to the progressive development of the horse towards the ideals of straightness, collection, impulsion, etc. that are central to dressage. The early history of dressage is intimately related to military developments. By the end of the 16th century, horses were no longer needed to bear down on the enemy, but rather to respond quickly and perform athletic maneuvers; thus the breeds of horses and the methods used to train them had to be adapted for these changes. Spanish horses were infused with Arabian blood and Naples became a center for the proliferation of these horses. The Neapolitan horses were particularly suited for the lighter forms of combat, being capable of greater collection and maneuverability than the more draft-like horses used in lance combat. New methods for training these horses of Spanish/Arab origin were also initially developed in Naples, and from there both the breed and the training methods were exported to the rest of Europe over the 16th century. The Spanish and Neapolitan horses were quite popular and became the foundation for many European studs that still survive today, such as the Fredericksborger stud in Denmark founded in 1562, the Kladruber stud in Bohemia founded by Maximillian II, in 1562, and the Lipizzaner stud founded by the Austrian Archduke Karl in Lipizza, near Triest, in 1580 (which still provides the Spanish Riding School in Vienna with its stallions, and the "Spanish" part of its name). The goals of the Italian style of training, recorded in numerous equitation manuals of the period, were to produce a horse that could move in a balanced and collected manner through the various gaits and figures, as well as a horse that looked magnificent and imposing. Horses were taught to carry themselves with their neck arched, with more weight on the hind end, and to move with a high stepping action. This frame is idealized in artwork of the 16th century, particularly in the depiction of the mounted noble, whose own magnificence was closely tied to that of his horse. The horse was also schooled in the various battle maneuvers (known as "airs"), both on the ground and in the air, that could be used to attack or frighten an enemy. What began as schooling horses in "battle" movements developed into a rigorous and lengthy training process known as the high-school style or haute école, which gradually became more concerned with the correctness and aesthetic qualities of the horse and rider than with military necessity. Through schooling, horses learned to lift their legs in the majestic and elevated piaffe and passage. Horses were also taught to perform pirouettes, which would supposedly allow the rider to fight with multiple opponents at close quarter, or turn quickly to escape attackers. The airs above the ground were derived from teaching the horse to lower its hindquarters to such a degree that it lifted its front legs off the ground in a controlled half-rear known as the levade or pesade, which could shield the rider from a frontal attack. From this developed the mésair, a series of successive levades that allowed the horse to advance by touching the ground briefly with the forelegs while springing forward with the hind legs. Two of the airs were supposedly used as attack maneuvers: the courbette, in which the horse jumps forward on its hind legs from the levade, and the capriole, in which the horse leaps up into the air and simultaneously kicks out with its hind legs. However, not only have I been unable to find any sources that mention the use of above-ground airs in battle other than hypothetically, but the movements themselves take such extensive training and intense concentration that I should think they would have been highly impractical amidst the chaos of war. I think it is more likely that these airs have primarily participated in stylistic representations of the "art of warfare" rather than any actual state of war. Like many of the artistic endeavors in the Renaissance, the "new" style of riding had its roots in classical civilization. The writings of Xenophon (c. 430-354 BCE) indicate that the style of riding advocated by the sixteenth-century Italian masters had at least some classical precedents. Xenophon's works were circulated in Italy at least as early as 1516 (Florence), first in Greek, then in Latin (1534), and finally in Italian. According to Alois Podhajsky, one of the most influential directors of the Spanish Riding School, the first Italian riding masters of the high-school style of equitation were acquainted with the classical treatises. He claims that "Grisone had studied Xenophon's work very carefully, especially his instructions regarding the seat of the rider and the carriage of the horse, which he adopted almost word for word." However, it is clear that Grisone and his pupils advocated fairly brutal methods of training, which is not at all consistent with Xenophon's teachings, though both were trying to achieve similar results. While much of Xenophon's treatise On Equitation discusses selecting horses for purchase and training them in the arts of war, he does outline the methods for training a horse in high-school work. He explains to the reader how "to treat a good war horse so as to make him more magnificent and spectacular to ride," and more specifically, how "to train a horse for parade, for high-school work, and for brilliancy." What follows is a brief explanation of how to achieve the raised neck, flexed poll, and high action that a horse naturally exhibits when showing off. He stresses that this is not done by force, for then the horse is moving out of anger, rather than out of the spirited pride that comes with a sense of freedom and self-carriage. Some of the movements Xenophon describes sound very similar to the high-school movements that were being practiced in sixteenth-century Italy. For example, he explains that by simultaneously commanding the horse to spring forward and checking it with the rein, the horse will become excited, throwing its chest forward and lifting up its legs. "But if when he is boiling over like this you give rein, immediately, through pleasure at thinking himself freed from the bit by the slackness of the rein, he bears himself magnificently, with haughty carriage, his front legs moving freely, copying in all respects his behavior when showing off in front of other horses." Not only is this fairly similar to modern descriptions of how to achieve collection, it could also describe something like the modern passage. Xenophon goes on to explain a movement that sounds similar to the levade or possibly the courbette. A horse that is "naturally endowed with great-heartedness of spirit and strength of body" can be trained to "bend his hind legs on his hocks and lift his forehand, so that those straight in front of him can see his belly and sexual parts. And when he does this you must give him free rein, so that to the beholders he may appear to be doing of his own free will the finest actions proper to a horse." He states that "such are the horses upon which gods and heros are depicted riding, and men who manage them will present a magnificent appearance." Clearly, the Italian humanists absorbed this advice right along with ancient theories of art and music, and used it to propagate their own image of majestic statehood. By the end of the 16th century, Italian and French noblemen began staging elaborate tournaments with sets, costumes, music, singing, and storylines, much like the emerging genre of opera. These events would often culminate in an equestrian ballet, in which the horses were ridden in intricate patters and movements of the high-school to the accompaniment of music. This tradition became very popular throughout Italian, French, and German lands during the 17th century. It was around this time that classical schools of riding were founded with the aim of training horses and riders in the art of dressage. One of the few remaining schools with a continuous tradition is the Spanish Riding School in Vienna. There, horses from the royal Lipizzan stud were trained for the benefit of Habsburg nobles, until the twentieth century when the school became a public venue. From the revenue of shows and tourism, the trainers there are able to continue passing on the classical tradition from generation to generation through a rigorous apprenticeship system.